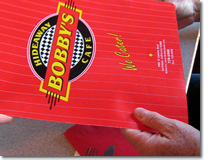 Whether your appetite's craving a hearty breakfast, lunch, dinneror a lighter something in betweenBobby's down-home, cafe cuisine is sure to offer you one of the best gourmet "good eats" meals in North County. Our food prep is hands on and we pride ourselves in using the best fresh ingredients available (not the flash frozen, microwave-friendly fare found at other places). You'll find our seasoning well balanced and our flavors multi-layered. Why? Because first and foremost, we're foodies who take pride in what we create. 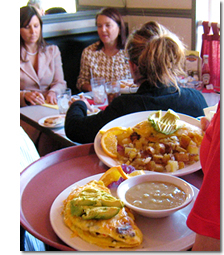 We offer a full breakfast menu featuring omelettes, pancakes, french toast, and some South of the Border favorites too. 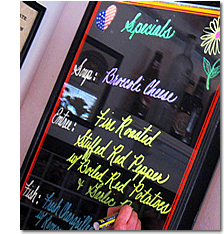 Served with your choice of country potatoes, cottage cheese or chunky apple sauce, and toast or biscuit or muffin. Tender, hand-breaded and fried, served with country gravy and 2 fresh eggs. Folks visit us from many miles away for this meal. A real taste of good Southern home cookin'! 2 biscuits covered with homemade country gravy and served with 2 fresh eggs. 2 potato skins filled with 2 eggs scrambled with ham, onions and green peppers, covered with cheddar cheese. A real Chicago breakfast-without the wind and snow! Served with country potatoes and fruit. The breakfast tradition that never gets old. Toasted English muffin topped with Canadian bacon and 2 poached eggs, covered with Hollandaise sauce. Toasted English muffin topped with sautéed spinach, artichokes, 2 poached eggs and covered with your choice of Hollandaise sauce, country gravy, or cream mushroom sauce. Same as Eggs Benedict, on a grilled croissant. The price is right for this grilled croissant topped with 2 eggs scrambled with ham & green onions then covered with Hollandaise sauce. A crock full of Bobby's secret recipe topped with cheddar cheese and sour cream. Served with oyster crackers and homemade corn bread. A crock full of French onion soup topped with croutons and melted cheese. A mildly spicy Hideaway hybrid of taquito and chimichanga. We stuff a flour tortilla with chicken, black beans, rice and cheese, then deep fry it to perfection. Served with our own avocado ranch dip. A bunch of jalapenos stuffed with cream cheese, breaded, and deep fried. Served with your choice of salsa, light ranch, honey mustard, or sour cream n' chive dip. Our famous chicken fingers dipped in hot wing sauce and served with carrot & celery sticks, Bobby's homemade bleu cheese dressing and French fries. All the great taste of Buffalo wings widout dem bones! Tossed mixed greens topped with Bobby's Chili, cheddar cheese, black olives, tomatoes, green onions, sour cream, guacamole, and salsa. Crisp romaine lettuce tossed with creamy Caesar dressing and sprinkled with grated parmesan, garlic croutons, and served with parmesan bread sticks. Also available with charbroiled chicken or grilled salmon. A platter of fresh leaf spinach topped with crumbled bacon, alfalfa sprouts, red onion, sliced mushrooms, and chopped eggs. Served with a hot bacon vinaigrette dressing and parmesan bread sticks. Tossed mixed greens with Greek dressing, tomato, cucumber, onions, feta cheese, Greek olives and hard-boiled egg. Served with parmesan bread sticks. Also available with charbroiled chicken. Marinated steak charbroiled, sliced and served on french bread with sautéed mushrooms, onions and covered with melted jack cheese. 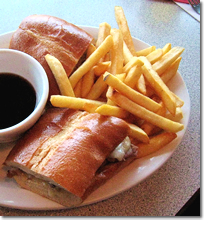 Check out San Diego Magazine's review of Bobby's Monterey Steak Sandwich. Need we say more about our sandwiches and burgers? Yesour burgers are made with "Certified Angus Beef." A generous portion of sliced roast beef on French bread, smothered with swiss cheese & served with a hot cup of au jus for dipping. Shaved ham and Swiss cheese served hot on a toasted bun with honey mustard dressing, lettuce, tomato and red onion. One taste and you’ll squeal with delight and sing from the mountain tops! Sliced baked ham, breast of turkey, and Swiss cheese all grilled between 3 slices of golden brown French toast. Indeed, say it twice for a thin-sliced corned beef, Swiss cheese, sauerkraut & 1000 Island grilled together on dark rye & served open face. Maybe Mom made it this waybut maybe not: Bacon, tomato, jack, Swiss and cheddar cheese on golden-grilled sourdough bread. Avocados, sprouts, orange slices, lettuce, tomato,mushrooms, honey-yogurt dressing, jack and cheddar cheese on wheat bread. 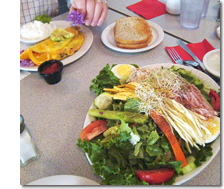 All served with soup or garden salad. Steak & Rib and Dinner entrees have choice of potato or rice pilaf. Pasta dishes come with homemade garlic bread. The tastiest, tenderest part of the steer! A 16-ounce bone-in rib-eye served with fresh vegetables. A full slab of baby back ribs, drenched in BBQ sauce and prepared just right! Served with cole slaw and homemade baked beans. It ain't good eats without meatloaf: Homemade, big & juicy with cream mushroom sauce. Served with homemade lumpy garlic mashed potatoes and fresh vegetables. A dinner portion of Bobby's chicken fried steak. Served with fresh vegetables. There’s fried chicken and then there’s Bobby’s Down-South pan-fried chicken! Boneless, skinless chicken breast breaded then panfried, topped with Bobby’s famous country gravy. Served with fresh vegetables. Another Bobby’s first! Boneless, skinless chicken breast stuffed with cheese, spinach & mushrooms, topped with marinara sauce, sautéed mushrooms and cheese, and served over linguini. Bobby's meatloaf Italian style with marinara sauce, sautéed green peppers, mushrooms & onions topped with melted cheese. Served with fresh vegetables.